Since ancient times, the Lao lunar calendar has celebrated traditional holidays, one per month, in a cycle called Hit Sip Song (the twelve traditions). These are celebrated in different ways in different areas of the country, with some of these rituals nearly disappearing. Get a deeper look at how Lao people honor their customs and build karma throughout the year. The calendar begins in December, this was traditionally a time for Buddhist monks to enter a period of meditation in a cave, a forest, or a remote temple, in order to make merit for the coming year. After the harvest ends, Lao people traditionally made merit to the rice spirits, so that they could have a plentiful harvest the next year. This is still famously celebrated with large ceremonial haystacks in Phieng District, Sayaboury Province. In the past, locals placed mounds of sticky rice on long sticks to grill and offer to monks. This practice comes from an old Buddhist story where a poor woman only had some rice and gave it to the Buddha instead of eating it herself. This is a large event throughout Laos. Each temple celebrates on different days. In the ceremony, monks chant the ancient story of the generous King Vessantara, who is believed to be a previous incarnation of the Buddha. Locals celebrate with village parades to their temple to make merit, listen to the tale, and make offerings. Lao New Year falls in the middle of April. Traditionally, everyone in Laos makes merit with family, cleans their home, and sprinkles water over Buddha images, elders, and monks to build karma. In modern times, this has devolved into a three-day water fight during the hottest month of the year. A Miss New Year pageant is held and the winner paraded through town, representing one of seven daughters of a mythical god. The best spot for both traditional and modern sides to this festival is in Luang Prabang. As the rice fields are prepared for planting, the most essential ingredient for a bountiful harvest is rain. 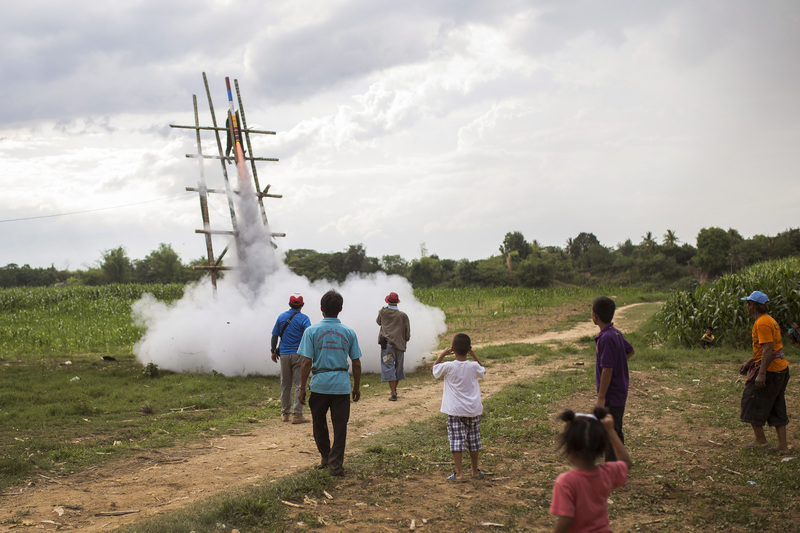 Lao people summon rain by launching homemade bamboo rockets at the heavens, so that the gods will take notice and grant their request. This is accompanied by much music and merrymaking. In the past, Lao people would make merit to protector spirits of their village, and to ask them to drive out evil and protect the happiness and prosperity of the people for the next year. The three month Buddhist Lent begins in July, which also coincides with the rainy season in Laos. Monks are required to stay in one temple for the duration, which comes from an old practice of wandering monks inadvertently trampling farmers’ crops during the growing season. Lao people make certain to give alms on this morning. On this holiday, hungry and forgotten spirits come out to wander the Earth. Banana leaf containers are made and filled with sweets and offerings to be left around fences, gates, and houses for the hungry ghosts. This holiday is also marked with boat racing on the Khan River in Luang Prabang. Lao people gather baskets full of food and household items and offer at temples to make merit for family members and ancestors who have already passed away. At the end of Buddhist Lent, Lao people make merit to the spirit of the river. Small floats are constructed out of banana trunks and decorated with banana leaves and flowers, as well as candles and small offerings. In the evening, these are set afloat in the river. Luang Prabang celebrates with a large decorated fireboat parade through town, while Vientiane celebrates with boat racing. The final holiday in the calendar is marked with a large merit making where people donate new robes and other offerings to monks. In Vientiane, a huge week-long festival is held at That Luang stupa where people from all over the country come to participate and build karma.